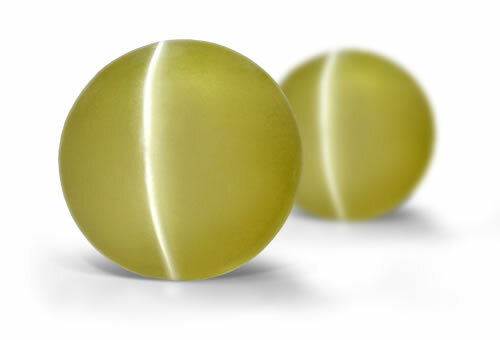 The term cat's eye is used to describe a phenomenal optical property in gemstones, but in this case, chrysoberyl. Known as chatoyancy, this effect appears as a bright, narrow slit--similar to the pupils in the eyes of your favorite feline. This phenomenon is caused by the presence of parallel fibrous or needle-like inclusions that interfere with the passage of light through the crystal, scattering and reflecting light back to the viewer as a thin line. refractive index, specific gravity, appearance and spectrum. Spectrum should reflect a strong diagnostic band at 444nm. Phenomenal chrysoberyl may exhibit chatoyancy, in which case it is classified as "cat's-eye chrysoberyl." Cymophane will show a broad sheen instead of a distinct cat's-eye. Most often seen with yellowish green to orangy yellow background with strong silvery white cat's-eye.Cat's-eye chrysoberyl is the only chatoyant stone allowed to be called by only the name cat's-eye. Rare stones might show 4 rayed stars.